SK Telecom and the Korea Transportation Safety Authority have built 5G infrastructure in the main experimental zone of “K-City,” an autonomous driving test city. An autonomous drive test bed was created based on a test network for 5G mobile telecommunication which is a wired and wireless telecommunication network for the next generation. This marked the first time that 5G infrastructure was built in an autonomous driving test city for the first time in the world. On December 28, SK Telecom and the Korea Transportation Safety Authority (KTSA) announced that they built 5G infrastructure in the main experimental zone of “K-City,” an autonomous driving test city. 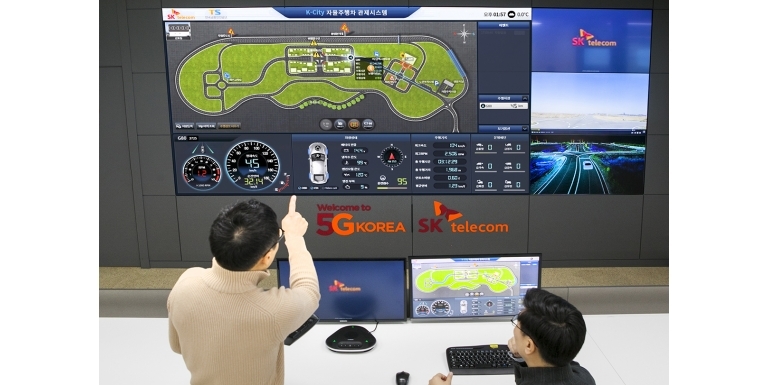 SK Telecom and the KTSA prepared 5G infrastructure such as a 20Gbps 5G test network capable of transmitting a 1GB film in 0.4 seconds, a "5G telecommunication control center" that exchanges data with test vehicles in 0.001 seconds and a 3D HD map whose precision is below 20 cm. "We will continue to expand 5G K-City infrastructure with the latest technology to ensure that K-City will be at the center of the 5G self-drive ecosystem," said Park Jin-hyo, director of the ICT Technology Center at SK Telecom.